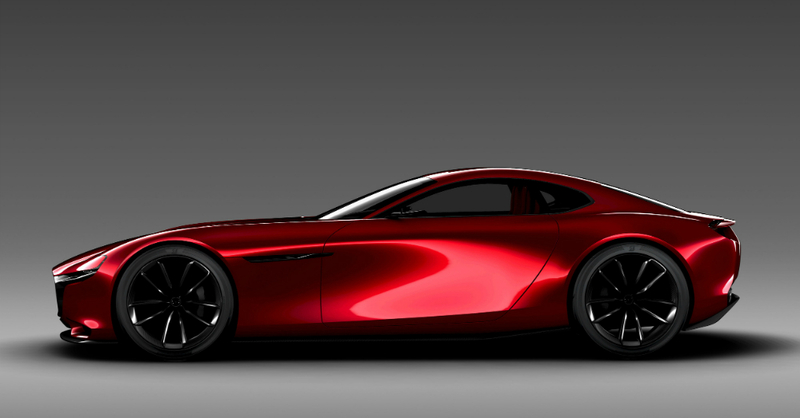 The RX-Vision Concept car that Mazda showed off recently was never meant to head into production. This car showed off the glorious style the Mazda is capable of producing using their fluidity of design that’s been described as the Kodo form of style, which is reflected in their flagship Mazda3 model as well. The company vehemently stated this concept car was only a concept and was never going to be put into production and that much is certainly true to this point, but the Vision design language may show up in another form to be a new sports car that we want to drive and a car that will continue the RX line of vehicles. New word from the Mazda team has led us to believe the next RX sports car, which would be the RX-9 has been officially approved to be the successor to the Mazda RX-8. Don’t get your money ready just yet or call the company to put down a deposit like one potential customer tried to do, this car hasn’t been shown off in concept form yet and probably won’t be ready to roll off the production line until 2020, but we can discuss some expectations for this new RX-9 that will soon make its way to the market. The beauty of the RX line of cars from Mazda is the fact that they are the only cars from a major brand that uses a rotary engine. Mazda committed to using these engines in their RX sports car line many years ago and continues to work toward making rotary engines the choice of other automakers, but mostly to be unique in using this engine under the hood of their sports cars. Using the rotary engine and offering a style that comes anywhere near what the Vision concept showed us at the shows recently gives us the thought that this new car will be something special. The next generation of rotary engines that will be used in the RX-9 is expected to be a pair of 800cc motors that offers a displacement of 1.6 liters. Add in the turbocharging that you can expect and a HCCI compression ignition and the power you can get from this engine would be around 400 horsepower which is seriously impressive in a car with such a small displacement. Mazda intends to keep this car light to allow for the most driving fun possible and has set the goal at 2,866 pounds for the overall car but less than that would be ideal. How soon will we see the new RX-9 in person? The expected reveal for a new prototype of the RX-9 is at the next year’s Tokyo Motor Show, which will mark the 50th anniversary of the first of these rotary cars. Two years later we might see the first production model make its way across the same stage in Tokyo to finally give us a peek at what the new 2020 model will be, at least those are the target dates for now, which could change.